The year seems to have flown by! I’ve been busy producing a whole host of playful and immerisve work and I haven’t had chance to write a blog for almost 12 months!! Here’s a brief re-cap of 2017. 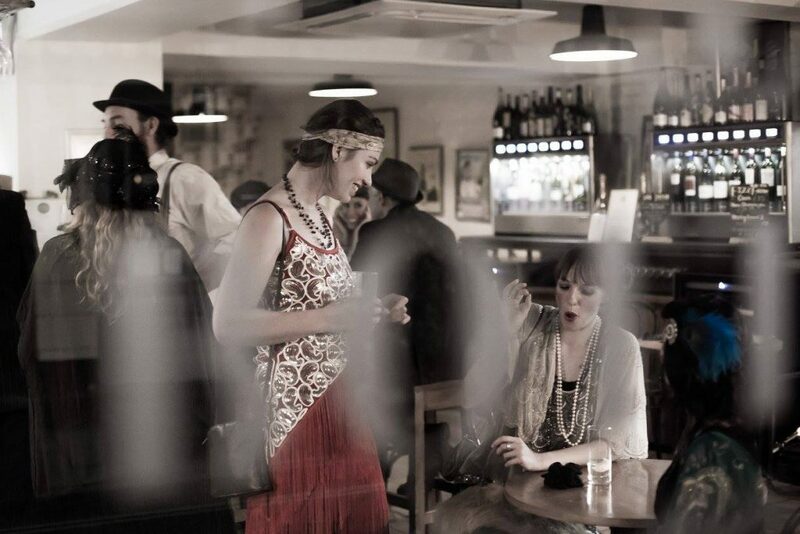 I started with an immersive Georgian gin tasting event in February featuring Stephan Bessant, then picked up my annual carnival project designing and creating the float with the fabulous young people at Pershore Youth Centre through April and May. Also during April I programmed and stage managed a new pop-up Nozstock stage at Hereford River Carnival bringing a good warm up for the best festival out there! At the end of May I hot-footed it down to London for a Green Man spin off, the Courtyard, Green Man, at Kings Cross taking my walkabout The Peggys to see the bright lights of the big smoke! Then June – back in Worcestershire, to Evesham for Asparafest and my mad-cap games The Asparalympics! Worcester itself for a Chamber of Commerce awards event, providing some pop up entertainment for the guests, followed by Hopfest, a wonderful family festival in Bewdley where I run an artsy area for young people and also some walkabouts for abit of cheeky fun for the adults. July is all about Nozstock. 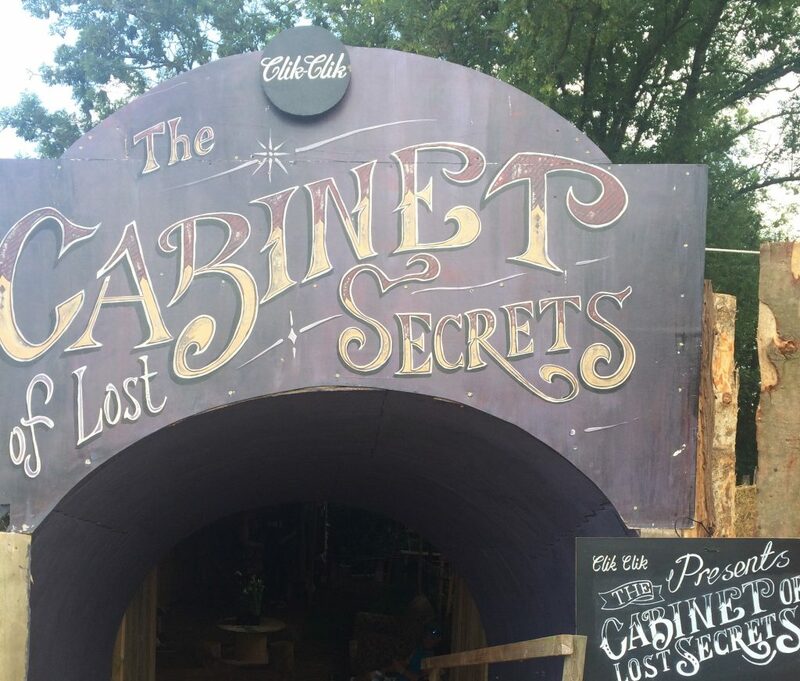 As Clik Clik, I produce the Cabinet of Lost Secrets, a weird and wonderful immersive live music venue based at Nozstock the Hidden Valley in Herefordshire. Its brought to life by an incredible Cabinet team, which is led by me working as art director/venue manager and Phil (Capas) Wilkins the design/build manager. We are supported by design/build assistant Graham Colledge (Sweetart Murals) and another 8 or so crew including a fab sound team and AV artist Vurfx. We spend a chunk of time on site building this unusual space in the rolling Herefordshire hills. 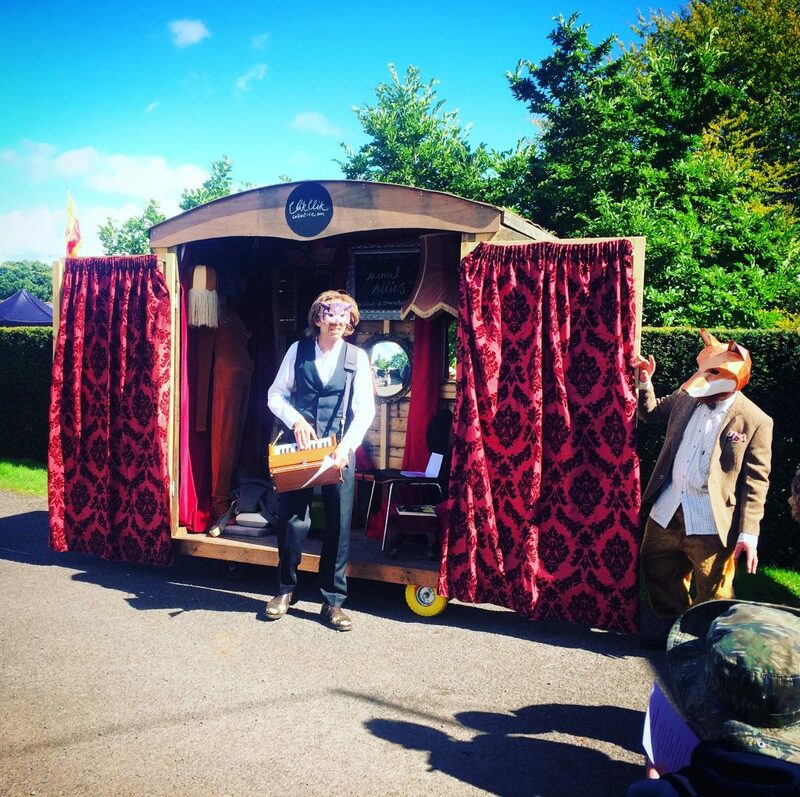 August and big festival time with my immersive, dark barbershop/photobooth Pie n Tash, based at Boomtown Fayre. 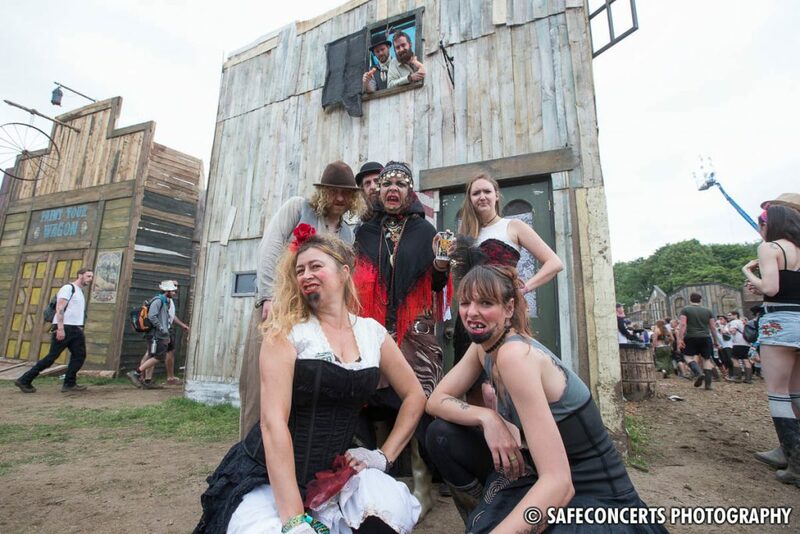 Think Sweeny Todd meets inbred freakshow or to quote a review “Sweendy Todd meets Brokeback Mountain”! Then onto the lush coutryside of Green Man Festival in Brecon with a new piece of work called Animal Allies based on Welsh folklore surrounding wild animals who act as our guides. Finishing off the month with the brilliant Kidderminster Arts Festival, where I presented The People’s Gallery for the town to make their own exhibition. Thats me up to now. 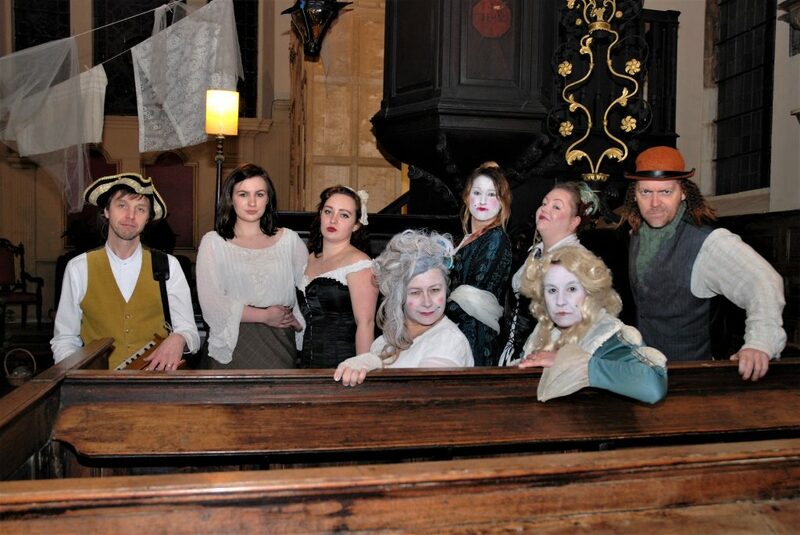 Looking ahead, I start back at Pershore Youth Centre again with some arts sessions for two groups through Oct and Nov, have a possible Halloween event in the pipeline, and then December – of course Gin Lane at the Worcester Victorian Fair! I’m looking to work at several Christmas markets with LSD Promotions during December too which takes me to Jan and a rest!